Mankind has been making star charts for thousands of years. Particularly for ancient societies, stars and other celestial bodies represented their mythological figures–gods, heroes, and wild creatures–each standing for a force of nature with power over their lives. For decades, historians and astronomers credited the ancient Babylonians with developing the earliest star catalogs. There is evidence that these catalogs were already incredibly detailed as far back as 5,000 years ago, including predictions of planetary motion, observations of eclipses, and the earliest known named constellations. But to Dr. Michael Rappenglueck, of the University of Munich, this history didn’t make sense. There is plenty of unassailable evidence that societies far older than the Mesopotamians were fascinated by the stars. Archaeological sites around the world, such as Stonehenge, show societies with less advanced mathematical knowledge than the Babylonians successfully developing complex astronomical calendars. And given the relative ease with which an observer can spot major stars with the naked eye, it is a long-accepted historical fact that celestial bodies played a critical role in ancient religion and mythology. So where, wondered Rappenglueck, were the maps? Why hadn’t very ancient societies pre-dating the Babylonians made diagrams of the night sky? According to Rappenglueck, they did, and archaeologists have been looking at them for decades without realizing it. 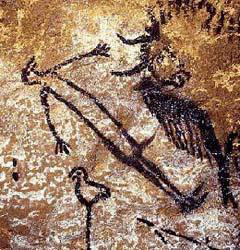 Amazingly, Rappenglueck claims to have discovered star charts among cave paintings created as long as 17,000 years ago. 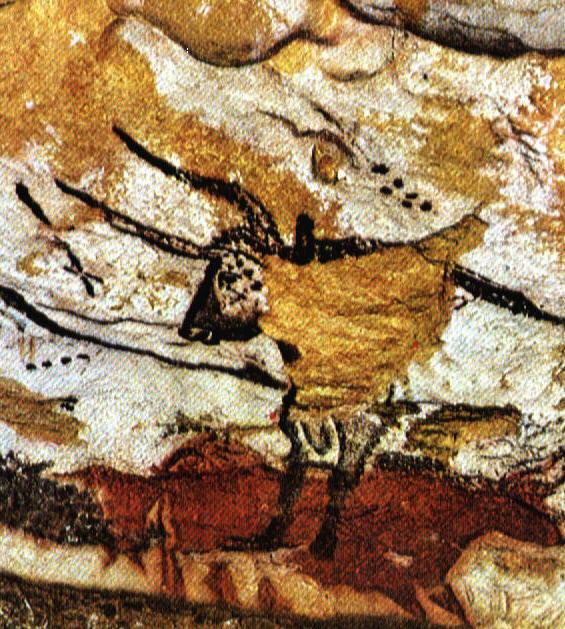 European caves such as Lascaux in France contain a large number of striking and extremely old hand-drawn paintings by prehistoric peoples. Some of these paintings are adorned with series of dots that, Rappenglueck claims, resemble what major constellations would have looked like tens of thousands of years ago. Rappenglueck used algorithms of stars’ movements over time to replicate what the night sky would have looked like when the paintings were created. According to Dr Rappenglueck, these outlines form a map of the sky with the eyes of the bull, birdman and bird representing the three prominent stars Vega, Deneb and Altair. Together, these stars are popularly known as the Summer Triangle and are among the brightest objects that can be picked out high overhead during the middle months of the northern summer. Around 17,000 years ago, this region of sky would never have set below the horizon and would have been especially prominent at the start of spring. In other words, these abstract paintings are actually ancient constellations dreamed up by prehistoric man. Rappenglueck has also found evidence of similar star charts in other caves. For example, he claims that an image from the “Frieze of Hands” in the Cueva de el Castillo cave in Spain is actually a representation of the Corona Borealis (“Northern Crown”) constellation. He has produced a paper detailing how he arrived at this conclusion, including explanations of how he reproduced what the night sky would have looked like thousands of years ago. The more one thinks about Rappenglueck’s hypothesis, the more it seems to make sense. Prehistoric peoples drew images from their world on the walls of the caves they lived in, so why couldn’t they have also drawn the stars? We know very little about what, if anything, these peoples believed in terms of mythology or religion, but if later civilizations could form figures of their gods in the heavens, why not prehistoric man as well? If these peoples would paint a bull or a horse or an antelope, why wouldn’t they also paint the figures they saw in the sky? Rappenglueck’s theories are very difficult, if not impossible, to prove conclusively, but other astronomers consider his work reasonable and plausible. If Rappenglueck is correct, that we can credit the men and women living tens of thousands of years ago with making the first graphical representations of the world around them–maps of the heavens, not of the earth. For a primer on stellar cartography, you can see this previous post. You can also learn more on Dr. Rappenglueck’s field of archaeoastronomy by clicking here. This makes sense. It’s not like the familiar ancients (Babylonians, Greeks, Chinese, etc) each came up with the idea of stars equalling mythic or religious figures. More suprising is that no scientist thought of this before! Heya i’m for the first time here. I came across this board and I to find It really useful & it helped me out much. I hope to present something again and help others such as you aided me. Heya i’m for the first time here. I came across this board and I find It really useful & it helped me out a lot. I am hoping to present one thing again and help others like you helped me. me in my opinion believe it from numerous varied angles. Its like men and women aren’t involved until it’s one thing to do with Lady gaga! methods to help prevent content from being stolen? I’d truly appreciate it. Hola! I’ve been following your site for a while now and finally got the bravery to go ahead and give you a shout out from New Caney Tx! Just wanted to mention keep up the great job! do with Lady gaga! Your own stuffs nice. Hey there, You’ve done an incredible job. I will certainly digg it and personally suggest to my friends. I am confident they will be benefited from this website. news media has long been dominated through the US and UK, mainly the CNN and BBC. I simply like the very helpful information and facts anyone supply for your articles or blog posts. We’ll save the blog site in addition to consider once again here on a regular basis. I will be fairly confident We’ll understand quite a few new things right here! All the best . for one more! not more popular given that үou definiitely have the gift. I really like your writing style, fantastic information, appreciate it for posting :D. “You can complain because roses have thorns, or you can rejoice because thorns have roses.” by Ziggy. Cartographia is a blog about how we use maps to represent the world around us, and how people interpret maps today and throughout history. Please feel free to send any questions, comments, or recommendations directly to me at cartographia.blog@gmail.com.